The Château kitchen is well stocked with everything you need for entertaining your family and friends. We pride ourselves on having our kitchen stocked with all the equipment you need to enjoy cooking with your group. Whether you are cooking paella by the pool, preparing breakfast on the terrace or even baking a cake we have it covered. 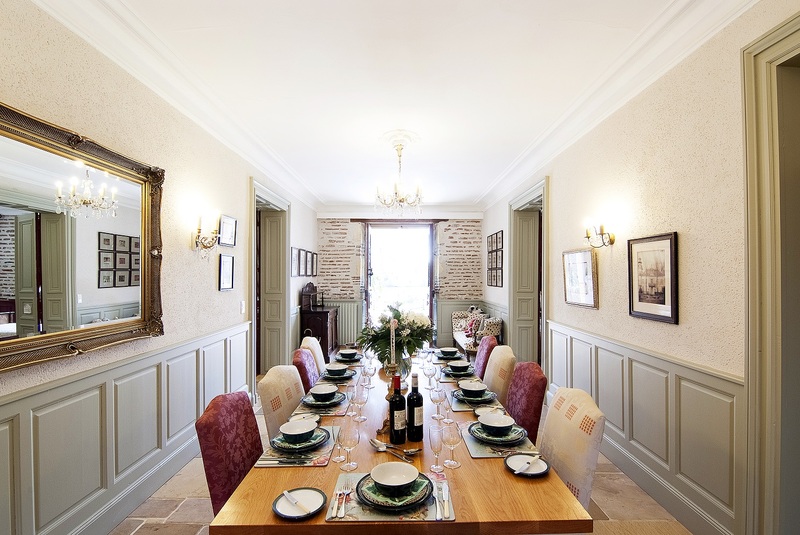 Dining together is all part of the experience here at Château Caillac. You have many choices to dine together including the covered terrace by the swimming pool, the south facing terrace overlooking the beautiful river or maybe the children would prefer a picnic in the Tree House, the choice is yours. If you prefer a night off from the cooking we can put you in touch with a private Chef, please ask for more details. There are 7 individually styled bedrooms, six are en suite, with a mixture of roll top baths and showers. The seventh bedroom has a large shower room close by. Many of the toilets are tucked away in the chateau turrets. All of the bedrooms have large shuttered windows with lovely views over the river or the garden. Each room is styled in its own exquisite way to show off the many period features. Which one will you choose?